There are so many rocks, mountains and spires with the name Cathedral in front of them that it becomes quite confusing. I believe the picture above is of Higher Cathedral Rock, but I can’t be definitive; sorry. Let me just say that while hiking along the meadows provided by the path laid out as part of the Valley Loop trail, there are many such peaks and spires to impress visitors. These natural megaliths stare down at hikers trekking the valley floor. 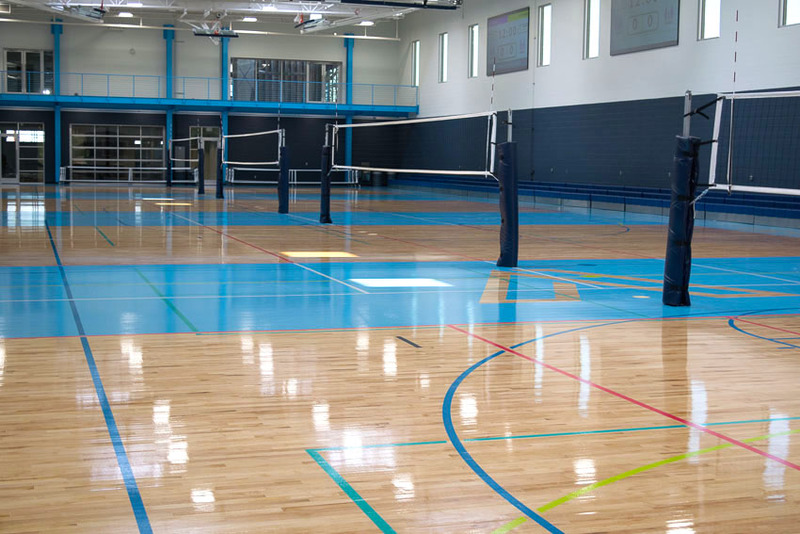 check out the Pickleball Schedule at the Victorium HERE. 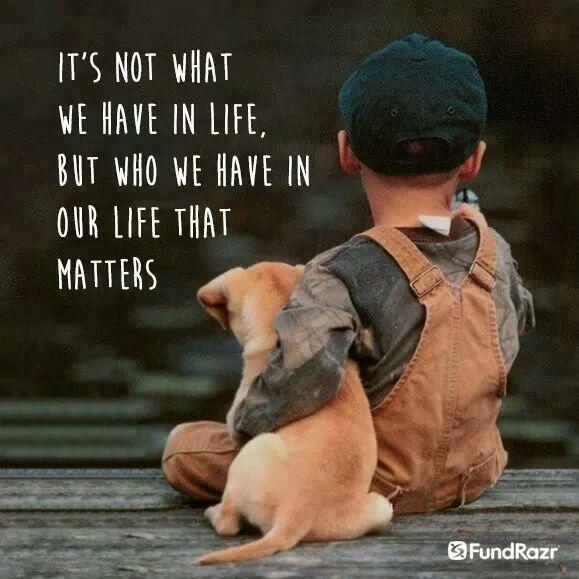 NOTE – You might have to scroll down a bit. 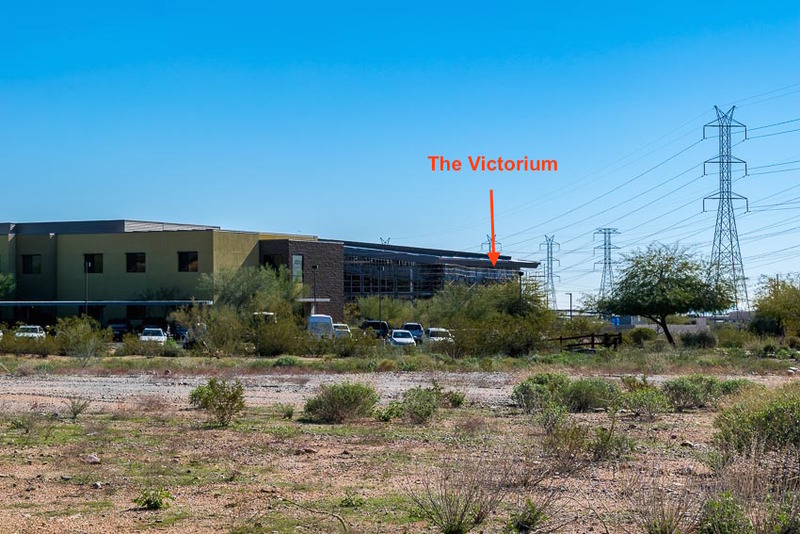 You might recall that in a recent email I talked about the Victorium, a new state-of-the-art gymnasium, that would be opening soon in Scottsdale and would offer pickleball play. 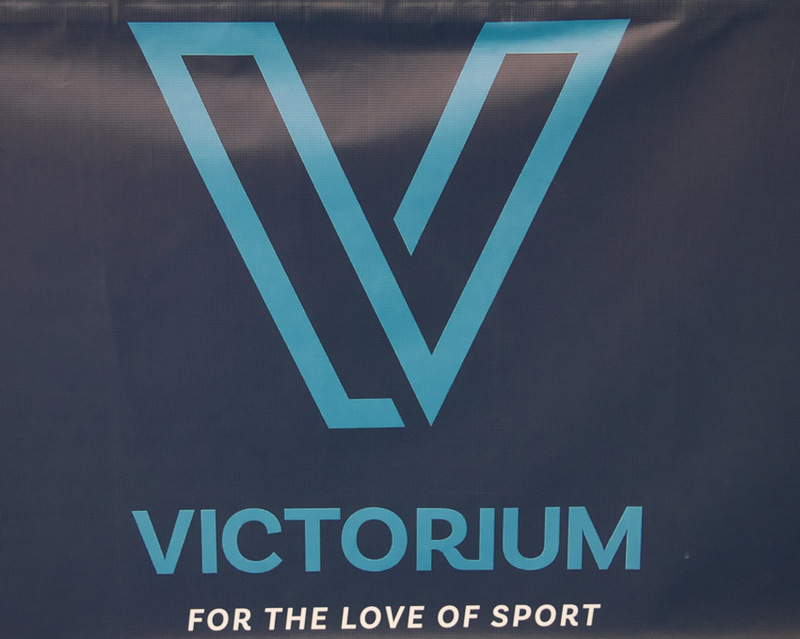 The good news is that the Victorium opened last week and they have had quite a few pickleball players attending. As a matter of fact, as I am writing this, the next Round Robin Session has been “sold out” (more about this below). 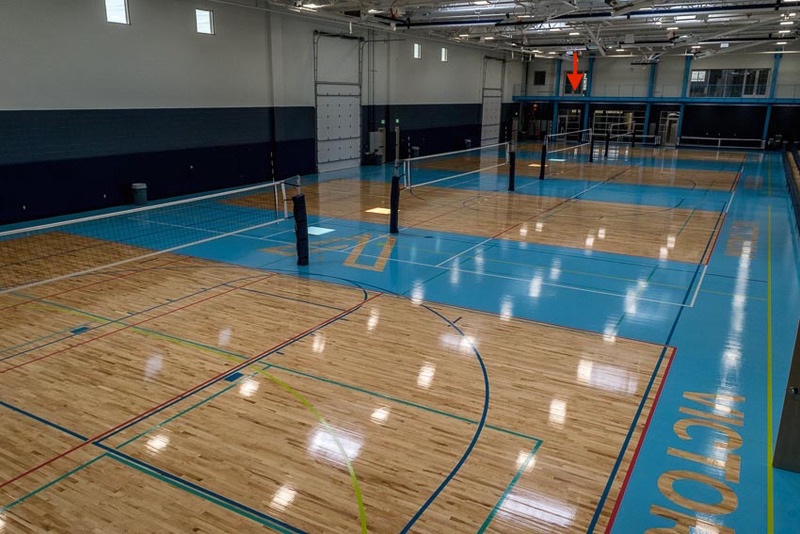 I thought you might enjoy a tour of the Victorium which is not complete at this point, but parts of the facility, including the pickleball courts, are open to the public for use. 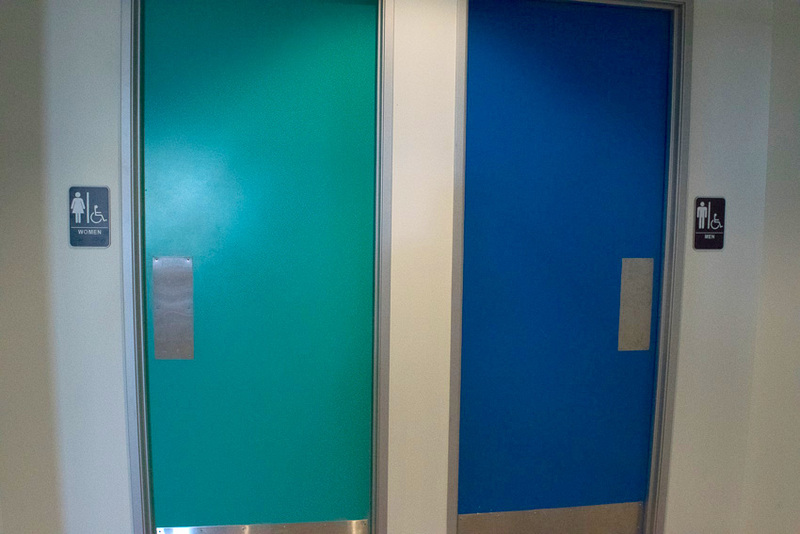 This is how the building looked on the afternoon of January 26th. As I indicated, it is still under construction. There is a temporary entrance on the southeast corner of the facility until the rest of the facility is open in two weeks. 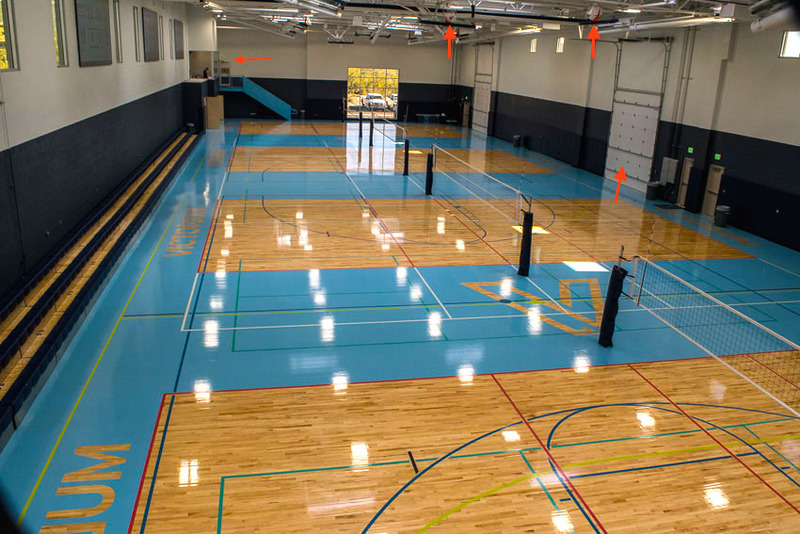 This view of the gym was taken from the catwalk..
Below is a view of the gymnasium from the opposite side of the facility. The arrow indicates where the Physical Therapy office entrance will be located! 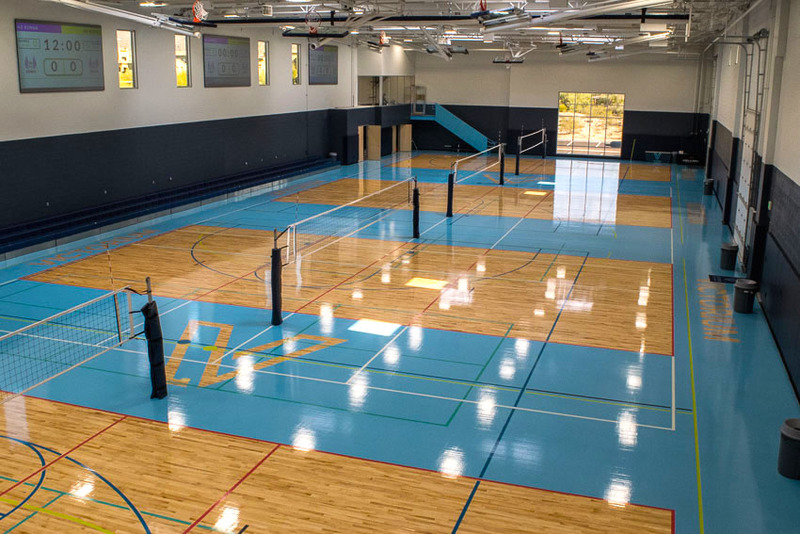 The main focus of the Victorium is volleyball, but it is well designed to provide venues for a number of sports. NOTE – In my opinion the glare was not as bad as it shows in the pictures, but I wasn’t playing pickleball. 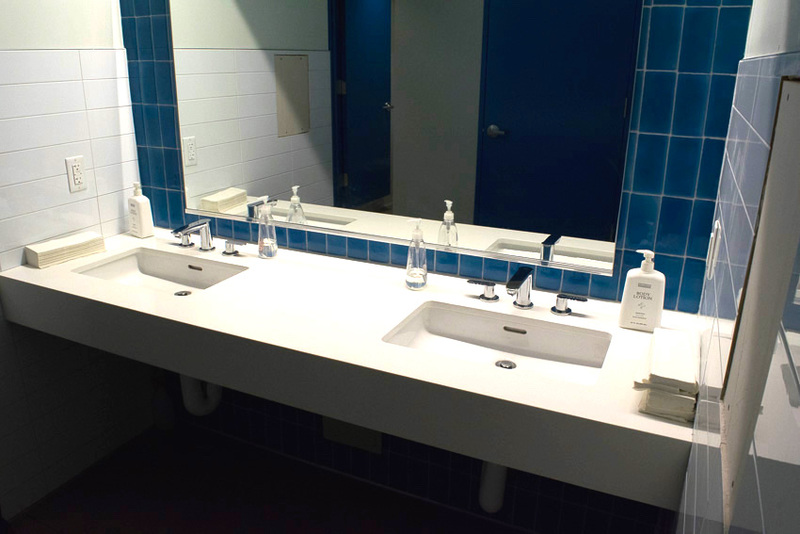 I think the angle form which I was photographing might have increased the glare effect. 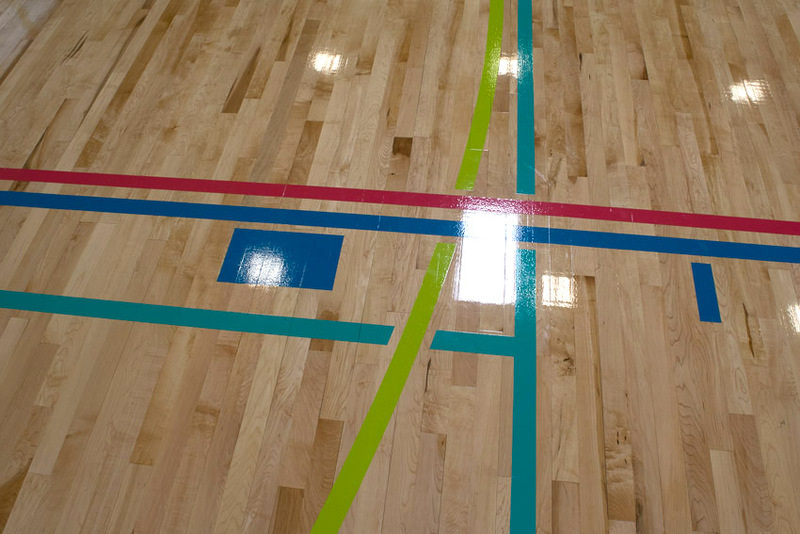 Here is another area of the gym floor with lines (teal is pickleball). 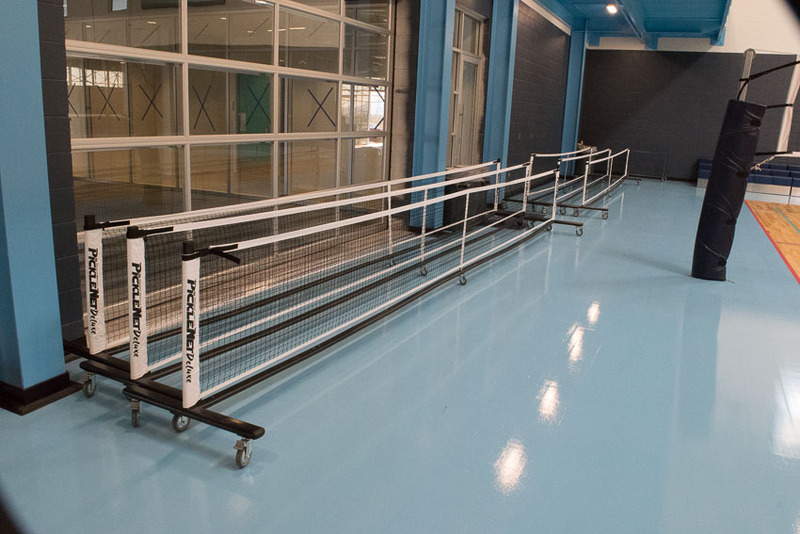 Pickleball nets are a sturdy, roll-about type which should help maintain the middle vertical bar since they are not taken down and set up over and over again. 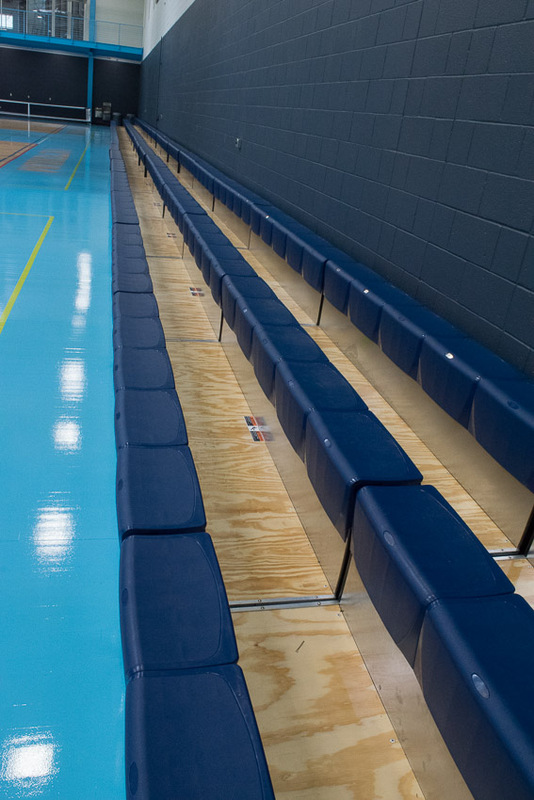 Instead of traditional, pull out, aluminum bleachers, there are rows of plastic seats. 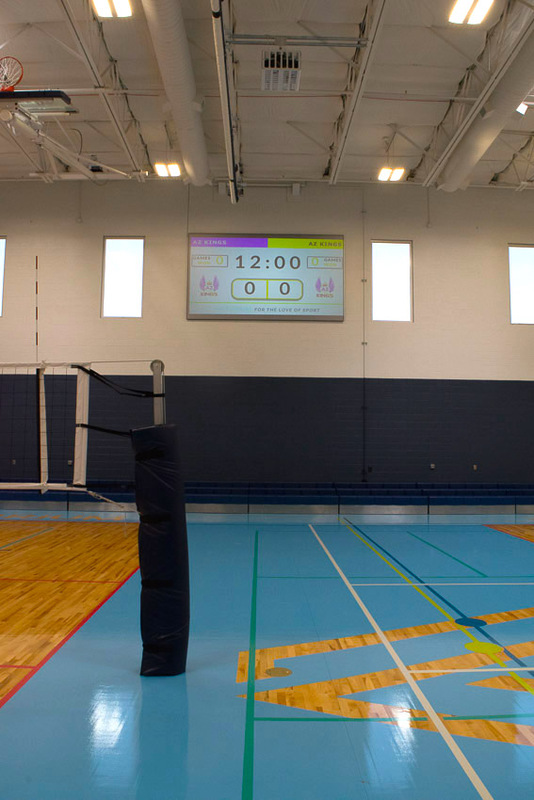 Giant television screens are mounted on the walls which will serve as scoreboards, etc. 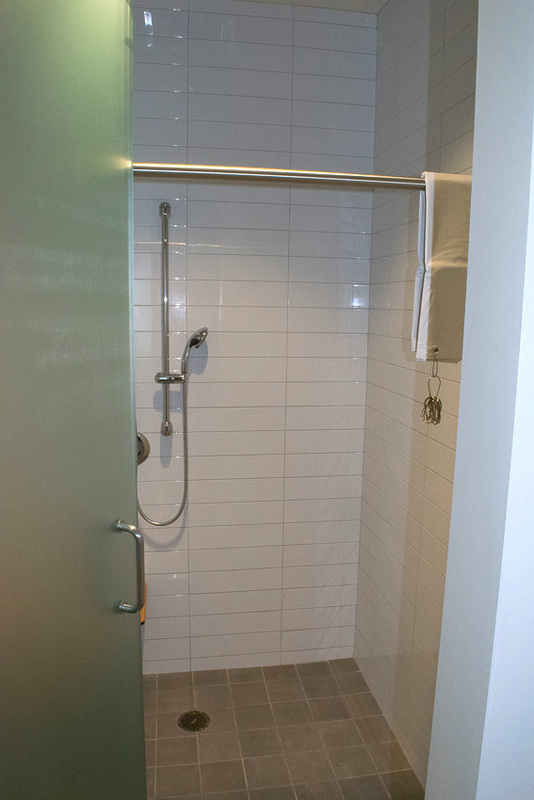 The comfort areas are well appointed with similar gender-specific facilities. 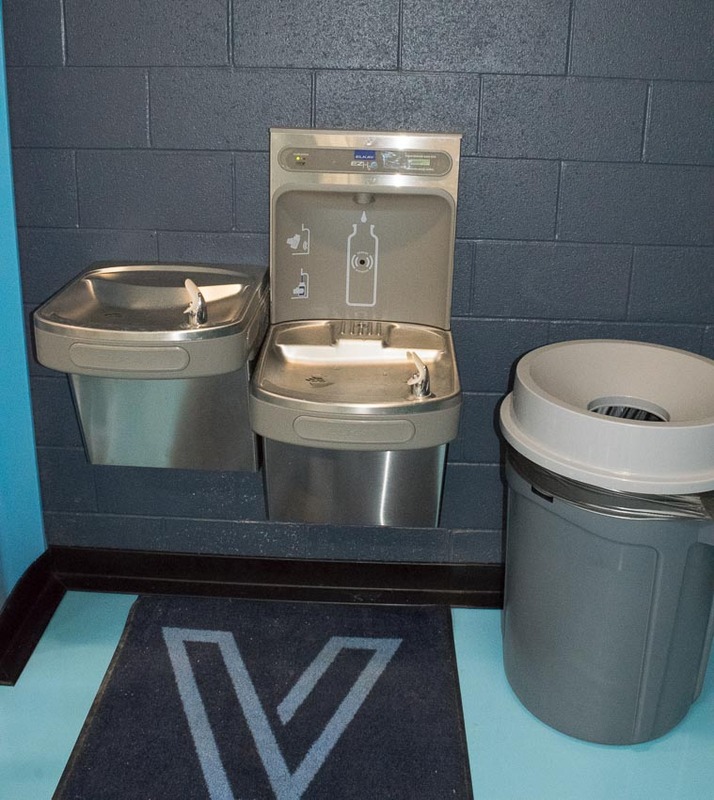 Another nice touch is a water bottle refill station as part of the drinking fountain. The arrows in the picture below point to garage doors (right) which can be opened when the weather is nice. 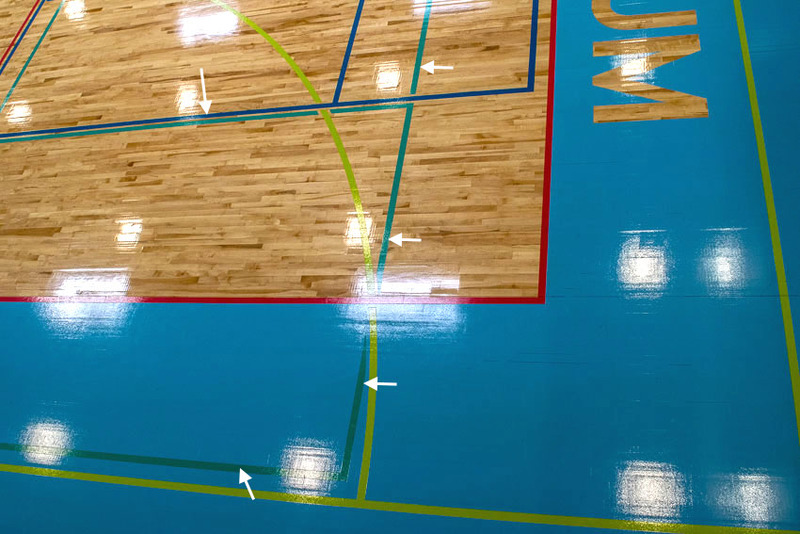 The topmost arrows point to basketball nets which can be lowered to accommodate hoopsters. The lone arrow on the left points to the office area at the Victorium. During construction parking may be a bit of a challenge, but there does appear to be a good number of parking spaces around three sides of the building. 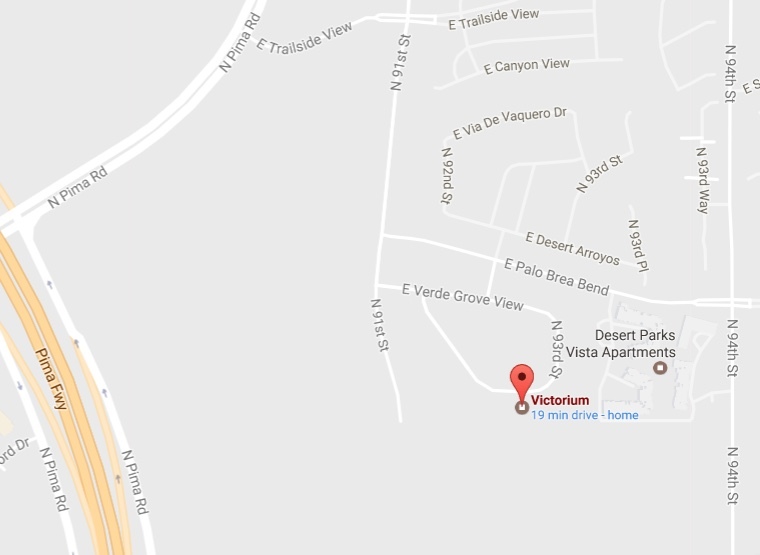 The Victorium is easily reached off of Pima Rd (see map below), but once inside the residential area, some GPS systems may be “confused.” The Victorium is located on Hidden Spur Trail. 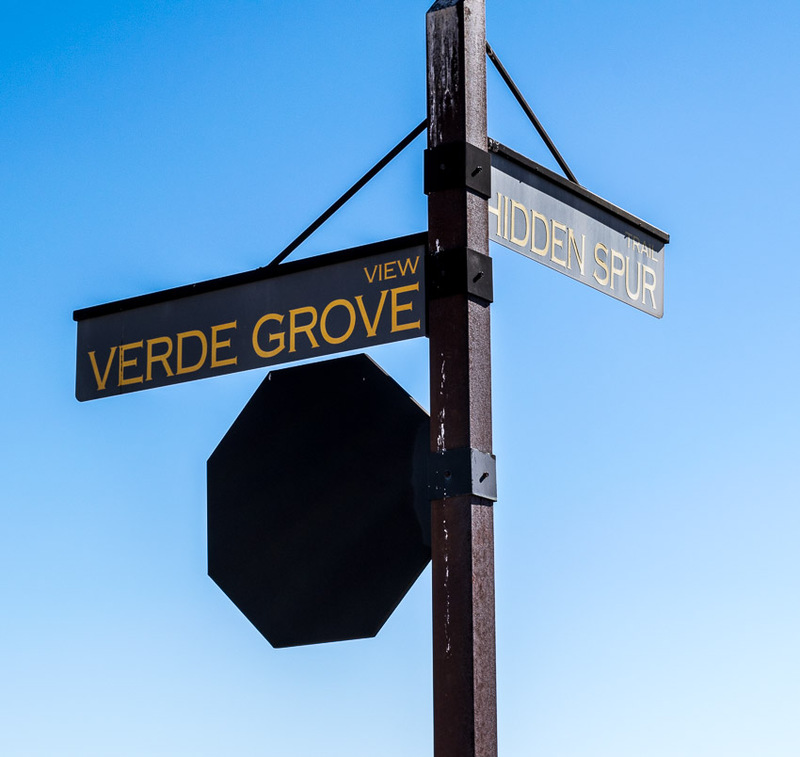 If you get a bit lost, you can look for either Verde Grove View or Hidden Spur Trail. This is a view of the building from the corner of Verde Grove View or Hidden Spur Trail. I hope you enjoyed the brief tour. 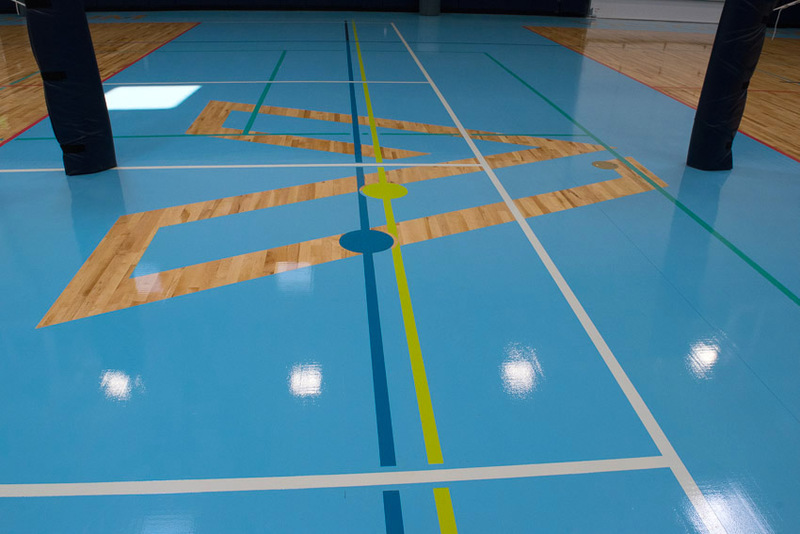 If you want to play pickleball at the Victorium, I am putting links to their January and February offerings below. Please read the pages carefully. There are a variety of events including open play. 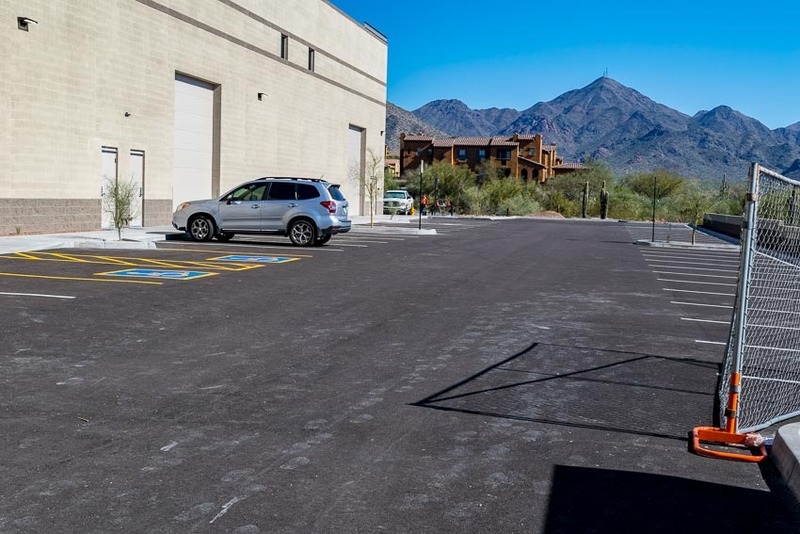 The Victorium has room for six pickleball courts. On days/times when round robin play and other events are in progress, open play may be limited or not available. I suggest you call first. Dee Davison’s, contact information is on the flyer, and she may be the best contact. NOTE – Some events require sign up in advance. To see the Victorium’s Schedules, CLICK HERE! 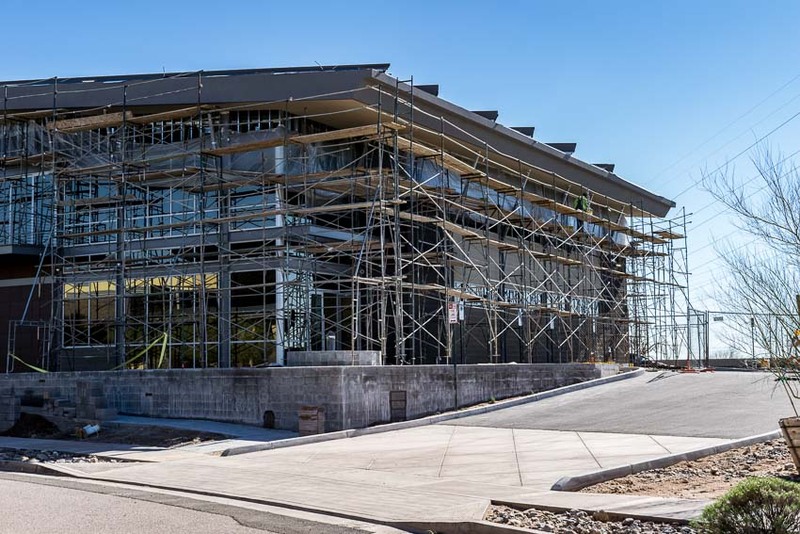 The large garage doors will have “netting” in place and can be opened when weather is nice. Except for tournaments, open play will be available from 7AM – 1PM for those who like early morning exercise. Check the attached schedules. Courts will be set up and ready at 7AM. There is a monthly pickleball membership fee of $40. Drop in play is $5. 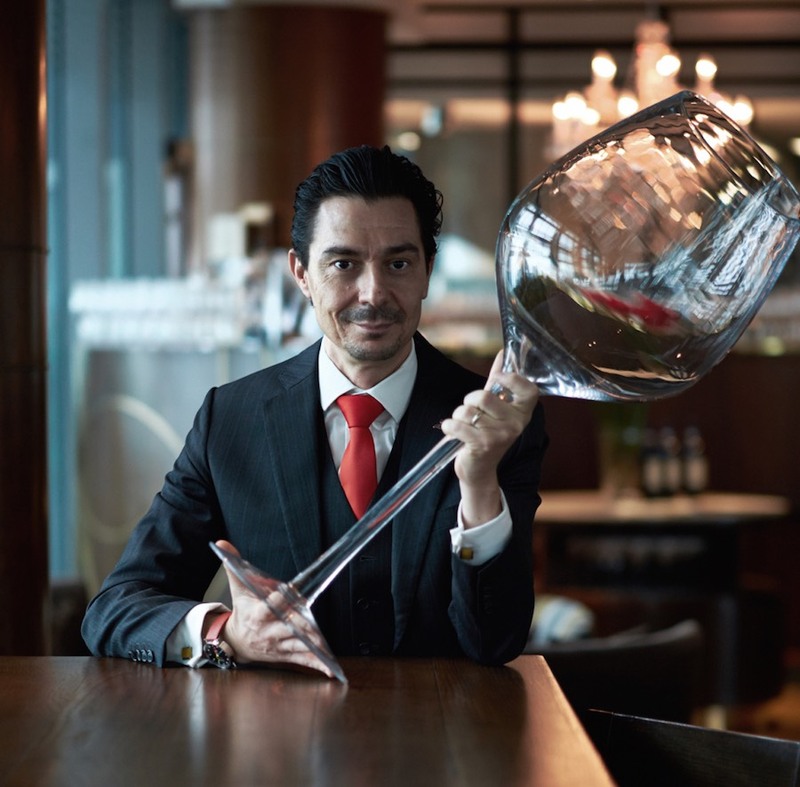 There is a potential that the Victorium will become a membership only facility. Pickleballs and paddles will be available for use at the Victorium. The paddles are sponsored by Selkirk. Until the snack bar and restaurant are open, it is OK for players to bring lunch and snacks. We decided to hike the entire Valley Loop Trail which takes adventurers near a number of the major attractions in the valley including El Capitan. 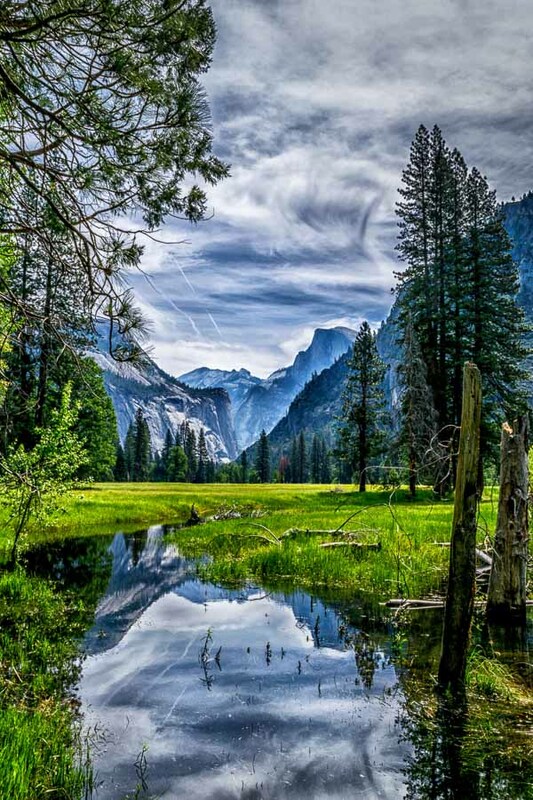 The photograph above is a view from El Capitan meadow looking back toward Half Dome. As you can tell, the view was stunning. The sky was dramatic and the valley was oh so green. You can see Half Dome peeking into the valley near the middle-right of the photograph. There were people in the area with blankets and binoculars watching climbers who were making their way up the large mountain. We were told by a tour bus driver that at night, there are a number of lights on the side of the mountain because climbers use them to read as they hang off of the mountain waiting for sleep and the subsequent sunrise. NOTE – Hiking El Capitan can take a number of days. Supplies must be hauled along as hikers complete the trek. We have described Sentinel Dome and the hike to the top and we have also shown photographs of Cathedral Peak which can be seen in the distance (near the middle) of this photograph. 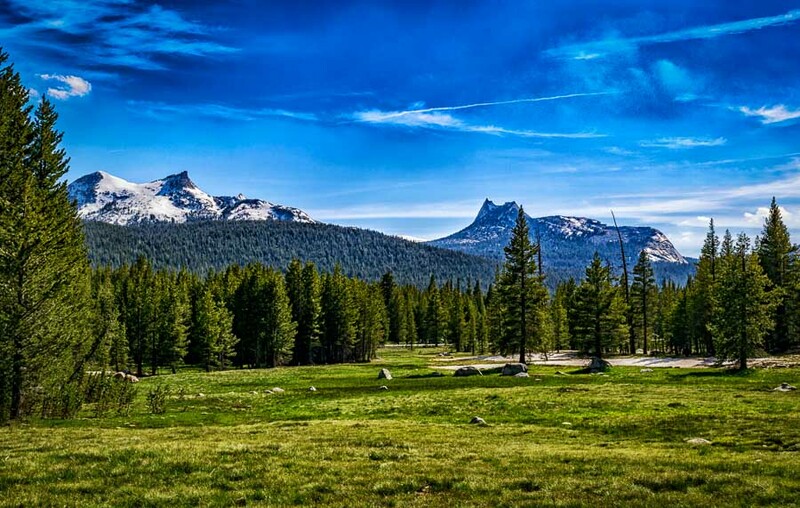 I would like to point out that Tuolumne Meadows is beautiful in its own right. 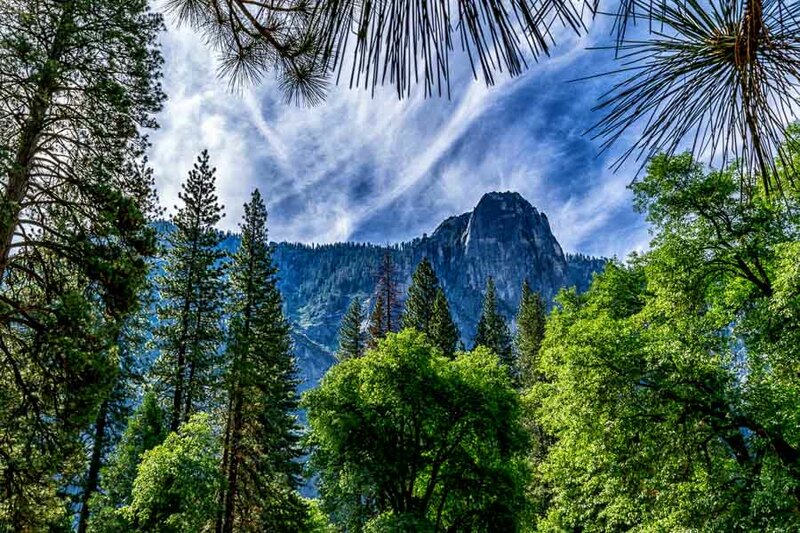 Look at the lush expanse of green grass and trees which leads up to the meandering Tuolumne River. The photo was taken as we were heading to the car after a long day’s hiking and only moments before, a Yellow-bellied marmot went scrambling across the field. I believe that during the warmer weather the field would have abundant wildflowers. 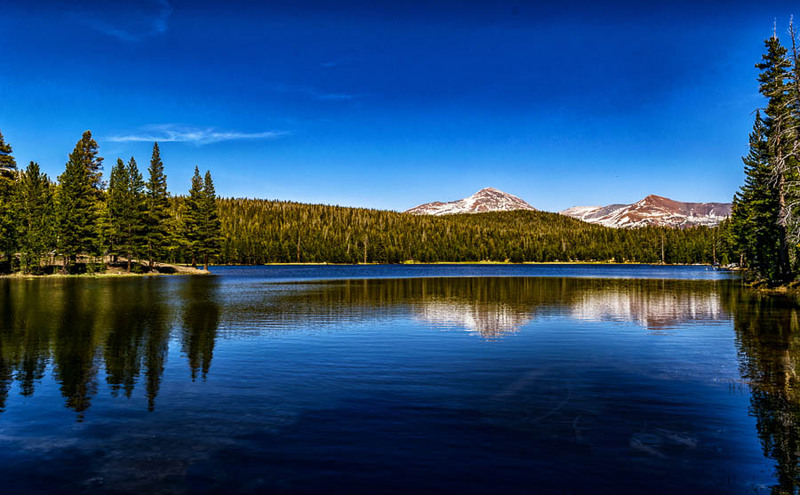 If you are hiking near Sentinel Dome or in and around Tuolumne Meadows, the hike to Dog Lake may be of interest. It is actually a side trail off of the main trail to Sentinel Dome. It is not too far from that junction and may provide an extension to a day of hiking. When we visited, the water was very cold and the shore was muddy because of the recent snow and rains. In drier weather, it would be easier to explore more of the shore line. We were getting to the end of our hiking day and we just stopped for a few pictures and to assess the lake.